At the end of the Second World War, British, American and Russian forces rushed to capture as much German technology as possible-as it turned out, the Germans had plenty to offer and their advances in aviation technology since the 30's came as a surprise to everyone- from supersonic rockets to jet fighters far faster than any their opponents had developed were nothing less than astonishing. In very short order, the best engineers and examples of their technology were rounded up and brought back to the United States (as well as Russia and Britain) for testing and evaluation. For Canada, Farley Mowatt brought back hundreds of examples of war materiel from tanks and guns to a V-2 rocket. Some of the war prizes eventually ended up in the National War Museum, as well as Ottawa aviation museum, but many were quietly cut up and discarded or otherwise lost to history- some relics may have even ended up in private collections or buried onsite at military bases. Sometimes when the weather is just too nice and my number of surplus sick days exceeds the number of days I'll likely have to stay home as a result of actual illness, the lure of skipping work to go flying somewhere becomes too great and I head for the airport. Today was one of those days, and so I decided a short hop to Brantford for a new set of tires for the RV-4 was in order. I don't know anything about airplane tires and the sales staff at Aircraft Spruce clearly didn't either, but fortuitously, as I was about to select a set, a local aircraft mechanic by the name of Bob Nelles happened into the store. Bob clearly DID know about airplane tires and after intervening and setting me up with the tires I needed, he also offered to help install them. Bob has a hangar on the field which was once a wartime hangar for Ansons and Harvards but is now home to his J3 cub on floats and a very cool Grumman Widgeon amphib (most will know it as the plane from Fantasy Island) that saw service in WW11 and is now owned by an ex-Air Canada pilot. I blew right past Bob's cub with barely a passing glance and beelined for the Grumman Widgeon. Fortunately, Bob has had more than one pilot in the past have the same reaction to the Grumman and he takes it in stride. In truth though, his cub is one of the neatest I've seen with his own home-made float/wheels combination which he uses to commute to his cottage. As it turns out, Bob has the same love of Canadian aviation history as I do and over the course of a couple of hours of swapping stories while changing my tires, Bob recounted one which I'd never heard before. It turns out that at the end of WW11, with the Russians quickly advancing on Germany, five Luftwaffe pilots were tasked with flying five ME-262's out of Poland in advance of the quickly encroaching Russian army back to Achmer, Germany. On the way there, one of the pilots, Fritz Stehle, flying ME262A-1 (known as White 5 because of the number 5 on the side) shot down a Russian Yak 9 in what would be the very last certified shoot down by a German fighter during the war. 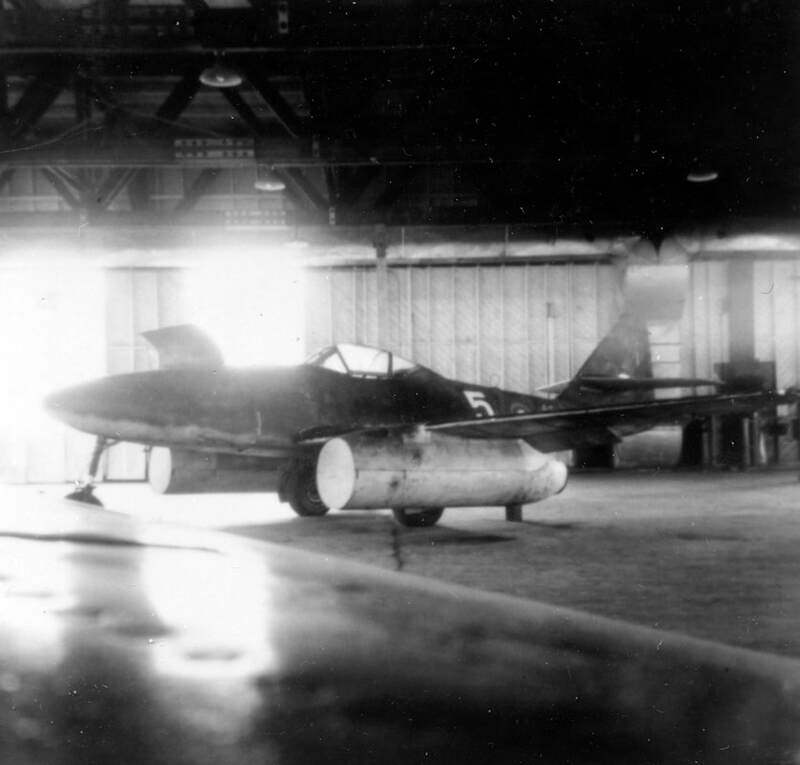 The jets were captured by the British in Achmer (or some accounts indicate Fassberg) and the photo above depicts serial number five-Stehle's fighter (probably just before shipping to Farnborough where it was displayed in 1945). The flag in the photo is a British identifier of wartime materiel to be shipped back for reverse engineering. Later, four of the amazing jets (including White 5) were sent to the airbase at Brise Norton and from there, two jets on to Canada. In August of 1946, the 2 jets were shipped to Montreal on the SS Manchester Shipper, with a brief stop in Toronto for investigation, and then, for White Five, on to the RCMP airfield in Aylmer, Ontario. A book published in 2002 indicates that the plane was destroyed during a fire-fighting exercise at RCAF Aylmer but Bob recounts a different fate which now appears most likely. This is the part of the story that blows me away since the plane burned in the fire was actually a Hurricane; the ME-262 at the time was the equivalent of today's F-22 Raptor, or super secret Aurora and it ends up in small town Ontario where it is scrapped for metal. Photographic evidence shows that the revolutionary jet engines were tested by the Canadian NRC but the data gleaned from these tests no longer exists- how could such important data been lost? Did Canadian aerospace companies learn anything from these engines other than the fact that large chunks of ice thrown into the turbines would ruin them? Did they simply not want to acknowledge that the Germans were technologically ahead of everyone else or did they not have the foresight to bring the German engineers along with the hardware to explain it like the Americans did? I'm no conspiracy theorist but you have to ask the question, how is it that Canada went from simply a manufacturer of airplane frames during World War Two (we didn't build any engines) to a leading designer/builder of jets at least for a few years in the 1950's before being left behind in the dust again? If nothing was directly copied from these jets, surely they must have inspired a few engineers to focus their efforts towards jet technology. Apparently the planes were offered to AV Roe (plans for the CF-100 started in October 1946) but they didn't want them and so at least one of the planes was sold to a Scotland Ontario local by the name of Cameron Logan who ultimately cut it up! 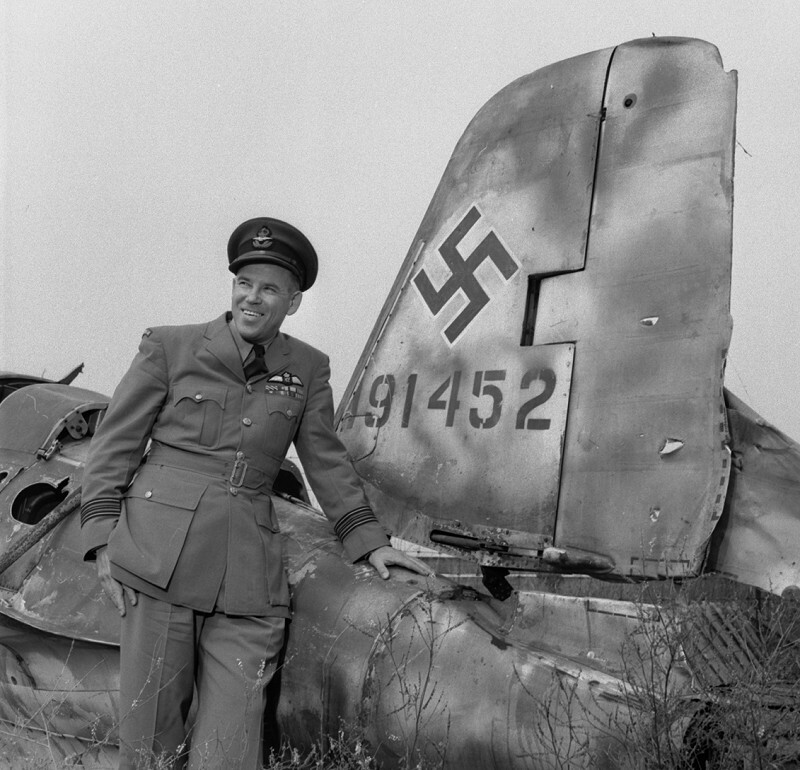 The same fate awaited other German jets brought back to Canada. It is likely that serial 17 was kept at Toronto and some believe that is buried on the airfield there-the Air and Space museum probably could have managed to pay their rent had they been able to locate it before they were kicked out! Bob happens to know the Logans who bought White 5 in nearby Scotland and confirmed with Cameron before he passed that, yes, only one of the jets came to Aylmer, but he still had a remnant piece that had been left rotting in the field. Of course, having even a piece of that plane was like a hockey fan owning a piece of the Stanley Cup and Bob gladly recovered it for posterity. So today, the last remnant (with the exception of the engines at the National museum in Ottawa) of the last German plane to claim a wartime kill, and the first jet fighter of the modern jet age sits tucked against the wall across from a lonely Avro arrow poster in a small hangar in Brantford, Ontario. 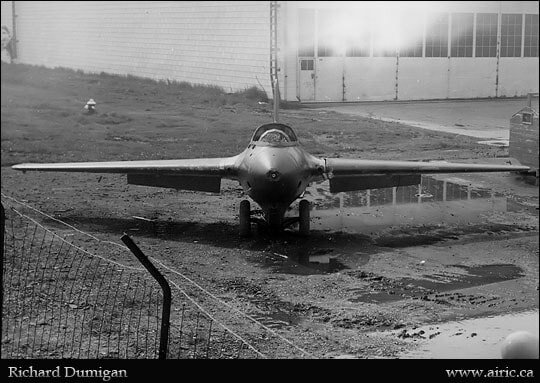 "Me 262A-1 (Werk Nummer 500210), AM 52, coded Yellow 17 of I./JG 7, surrendered at Fassberg and was taken over by No. 616 Squadron, RAF. It was flown to Lübeck on 29 May 1945, and then ferried to Schleswig and on to Farnborough on 9 June 1945. It was allocated RAF Serial No. VH509 on 14 June, and made at least one test flight in July at Brize Norton. AM 52 was shipped to Canada from Ellesmere Port on board the SS Manchester Shipper on 23 August 1946, arriving at Montréal on 1 September. AM 52 was sold to Cameron Logan of New Scotland, Ontario, about 1947, with 300 other war-surplus RCAF aircraft, and was eventually scrapped by him at New Scotland." Subsequent evidence shows that Harold is mostly correct except which plane was cut up. After arriving at Montreal it went to Toronto, Downsview. 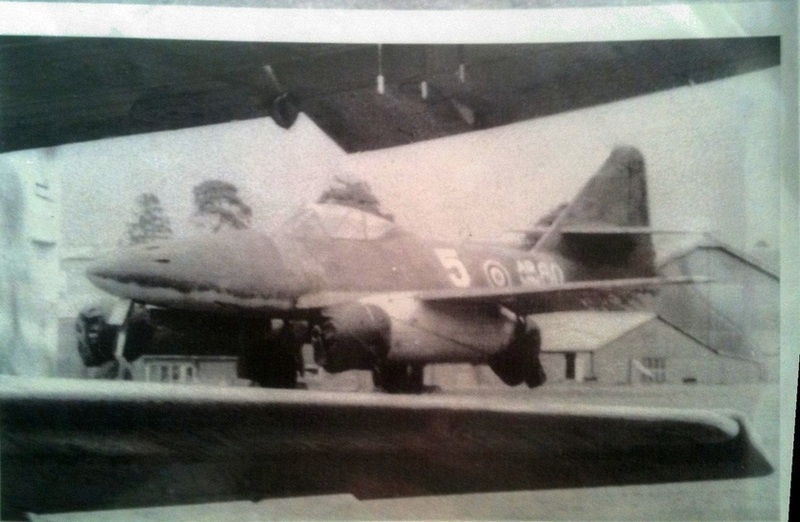 Photo below shows AM52 sitting in a Downsview hangar but Cameron Logan reported he only cut one ME-262 up- White 5 pictured in his driveway in the photo further down. FE-111in the photo at the top of the page, pictured at Dayton, eventually ended up as part of the Smithsonian collection. The rest of the photos and correspondence below details some of my efforts to piece together a complete story of what happened to these aircraft once they arrived in Canada. AM52 in the Downsview hanger. A popular rumour is that it is buried somewhere on the airfield. from CANAV book by Larry Milberry entitled, "The Leslie Corness Propliner Collection". 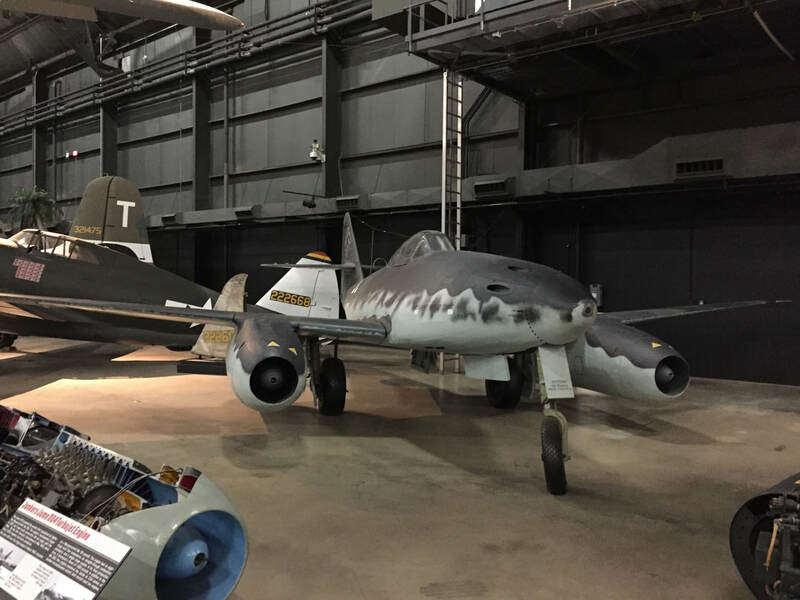 Ten Me 262; (1 at Dayton, 121442) 1 at Smithsonian in Washington and one at National Naval Museum (Pensacola) 1 owned by Paul Allen (Pensacola) So 6 missing or unaccounted for. Four Ar 234B; 140312 (FE-1010) at Steven Udvar, second one went to Freeman and disappeared, one reassembled and scrapped, one a mystery. One Ju 88G; One Ju 388; A JU88D FE-1598 was flown over to Wright Field from England-not on Reaper (430650Werk NMr) JU-388 is at Steven Garber. I can shed more light on the Fl 282s. The V12 and V23 came to the US. The rotor heads and transmission of the V12 did come to the Smithsonian and we still have it. The V23 was bailed to Prewitt Aircraft for evaluation. It’s status after that is unknown, but there are rumors of it showing up in barns decades later. It would be a huge deal if it ever turned up as there is no intact Fl 282. 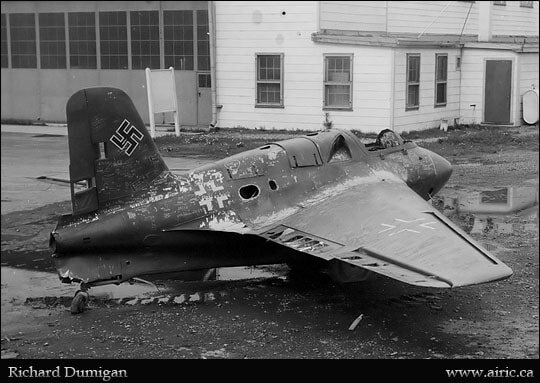 In addition, there is 1 ME-163 (191095) at USAF Dayton (gift from Canada) not on the Reaper roster, and another, 191452 destroyed in Arnprior, Canada and one in the National Air and Space museum in Ottawa.. Thank you for contacting the National Museum of the United States Air Force. Unfortunately, we no longer retain the Flettner Fl-282 helicopter as part of the NMUSAF collection. Flettner Fl-282, T2-4613,was acquired by the Museum on 12 August 1949. After many years in storage this aircraft was placed on loan to Sampson AFB, New York on 23 June 1954. When Sampson AFB closed in the summer of 1956, all items then on exhibit were returned to the Museum or disposed of in place. The aircraft was not returned from Sampson AFB and information indicates it was de-accessioned on 29 May 1957. Unfortunately, the method of disposal is not documented in existing records. To our knowledge the aircraft was most likely scrapped at Sampson AFB as no public record of its current disposition has ever been located. If you have any questions or comments please contact me. Good luck with your continued research and have a great day! 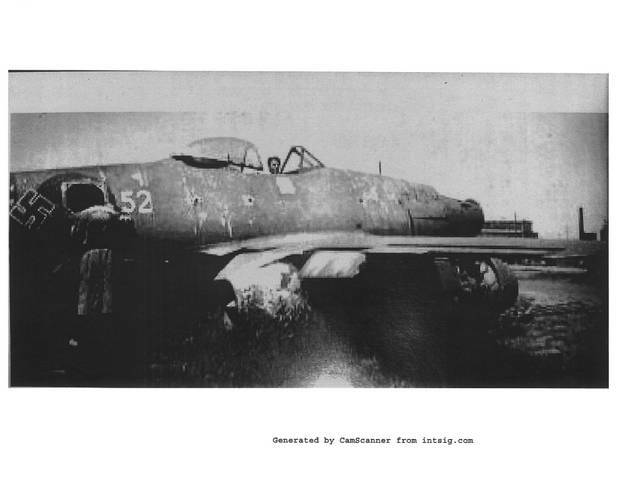 The aircraft was one of precious few swept wing designs at the time so the outline in the photo does seem to suggest that this may have been the ME-262. Future ground photos of the area will have to corroborate the theory.Personally, i think the image is way too big to be an ME-262 and is more likely some bushes or something resembling an airplane outline-no one has ever found another photo of the object on the ground so it's likely there was nothing of interest there to begin with. Interestingly, the designers of the F--86 acknowledged that many design ideas incorporated in the F-86 were gleaned from the ME-262 jets that were brought to North America not even a decade earlier- todays jet aircraft designers could learn a lesson or two about the timeline it used to take to bring a new design into service!. In particular, the thin swept wing design coupled with leading edge slats (which enabled slower approach speeds) were directly taken from the ME-262 since the original version of the F-86 had been designed as a straight wing. Copying the new ideas allowed North American the jump they needed with their fighter to produce America's first true production fighter jet. Speaking of copying technology, the V-1 rocket was also copied by Northrop with almost no changes into America's very first surface-to-air missile. The naval version was called the Loon and a remaining example exists in Canada's War Museum. http://en.wikipedia.org/wiki/Republic-Ford_JB-2. photo from the CNE archives. In 1943 the NRC was trying to develop Canada's incipient jet engine industry in support of the British jet engine program. some suggestions included developing a cold weather testing station (probably why they ran ice into the ME-262 engines) and also to build their own jet engine to get away from American and British dependence. In this endeavour they sent engineers to the UK to study jet engine design there. In the meantime, the government formed Turbo Research as Crown Corporation in Leaside, now part of downtown Toronto. A number of the engineers involved in the creation of the Report worked there, while others created the Cold Weather Testing Station in Winnipeg. The following is a sampling of some of the email correspondence I've made over the last while trying to piece together the story of the fate of these historic aircraft-with each email, it seems a little bit more of the puzzle comes together. Please note that I looked at the supplementary info file on our Jumo 004 engines. Sadly, we have no information concerning their donor. It is, however, quite possible that they came from the National Research Council of Canada. The donation date is also unclear but it looks as if all five were donated no later than 1967.
that any testing was done at Aerophysics. I am sorry that I cannot help you. Please note that a couple of colleagues were kind enough to look into your query. Sadly, none of ur Jumo 004 engines have the damage mentioned to the guide vanes. P.S. Ed: If you check the photo of '52' in the hangar with the Vampires, you will see the exhaust end of a Jumo 004 just under the nose of the aircraft. I think it proves that they were shipped to Aylmer or Downsview with engines intact, and confirms how the Museum in Ottawa got 5x Jumo 004s! 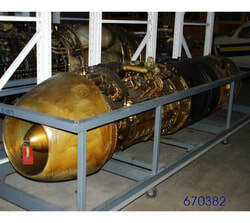 The fifth engine might be a spare, or from a later version of the Heinkel 162A-2 (Volksjager) two of which the Ottawa museum received in 1946...c/n 120076 and c/n 120086. 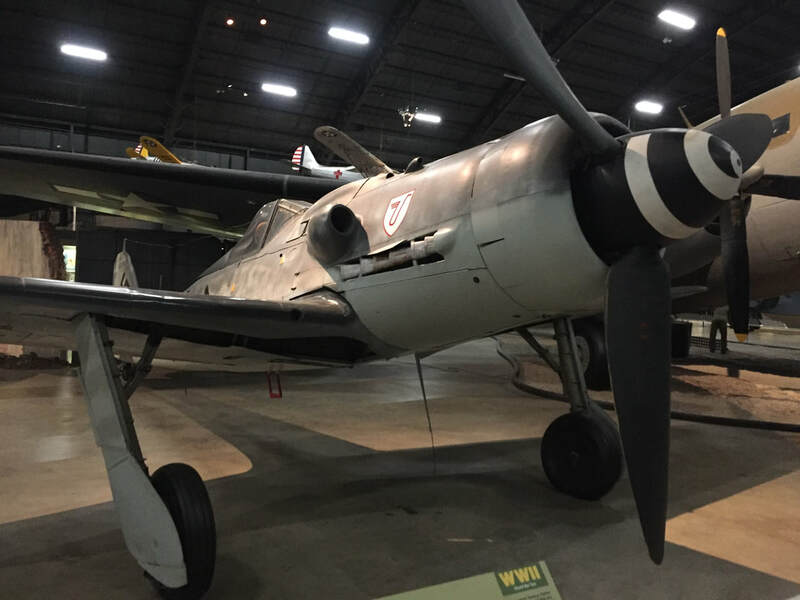 According to Ottawa's website, 120086 is on display, however, the person who purchased a copy of "The Captive Luftwaffe", which I now have, went to the Museum on February 12/96 and wrote on Page 53 that it was on display with no powerplant, just an empty nacelle on top of the airframe. Who knows what happened to 120076 ...in storage with its engine(? ), and is the 5th Jumo really the BMW 003 E-2 from 120086? 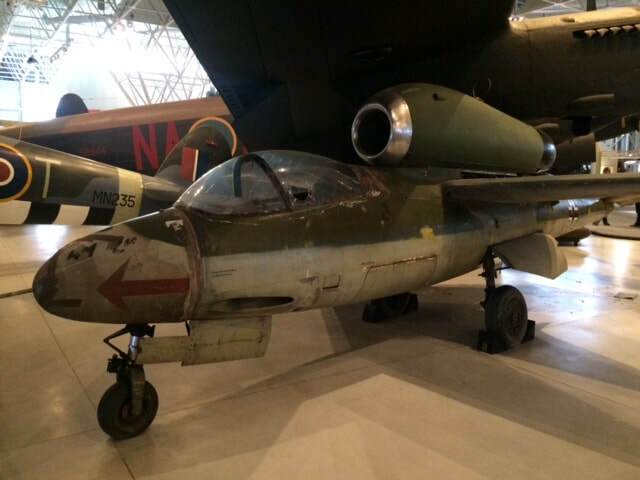 An Me 262 would have been an exciting addition to our Museum if someone at RCAF Downsview had considered preserving the world's first operational jet fighter, as '52' was still in pretty good shape when that photo was taken. Editor's note: After looking into the Arnprior ME-262, it appears to have actually been a ME-163 komet which was also a leading edge aircraft brought back as a war prize. Here is an article about it: http://news.google.com/newspapers?nid=2194&dat=19570918&id=aPkxAAAAIBAJ&sjid=9eMFAAAAIBAJ&pg=4075,3845208 Interestingly, Harold Skaarup also refers to an ME-163 number 191454 as the Arnprior ME-163, but this one is clearly 191452. where is 191454 that the documents show? See the bottom of this page of some 1957 photos I've stumbled across of the airplane dump at Arnprior which prove 191452 was the Arnprior plane. The Komet at CASM was acquired in 1964 from the RCAF and is werknummer 191916. Thanks for your email and the aerial photo. I did a computer search for all photos and files for 1948 and got 504 hits. The computer brings up the scanned images, so I checked all of them but didn’t see anything that relates to your request. I also blew up and looked at the few aerials from that time, but didn’t see the planes (most of the aerials were taken in such a way as to leave out the spots where the planes were located, or I just see trees). So, I’m afraid we don’t have anything. We actually don’t have a lot of photos for the years just after the Second World War up until about the mid-1950s. I’m not sure why that is. You could try the National Archives as they have the photos of the Department of National Defence. We do appreciate you sharing what you find. Thanks! 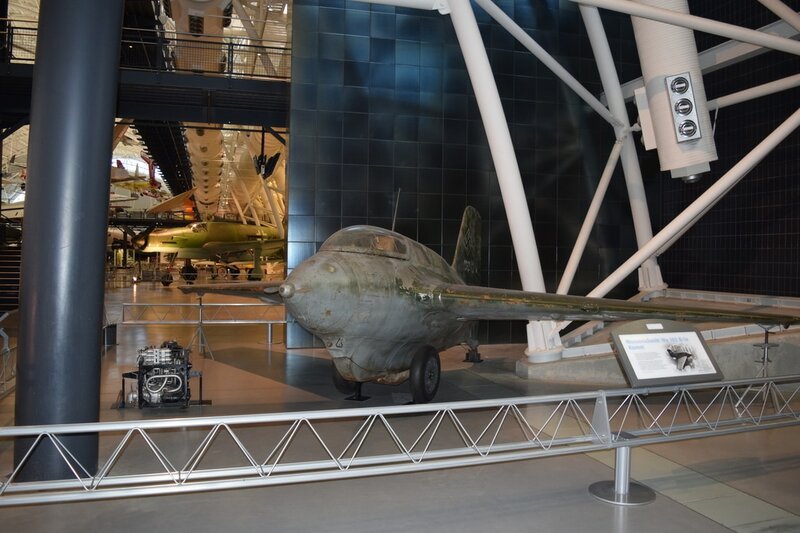 I received your request for information regarding the ME 262 at the National Air and Space Museum. Unfortunately the early records do not provide too much information, as you have experienced already. 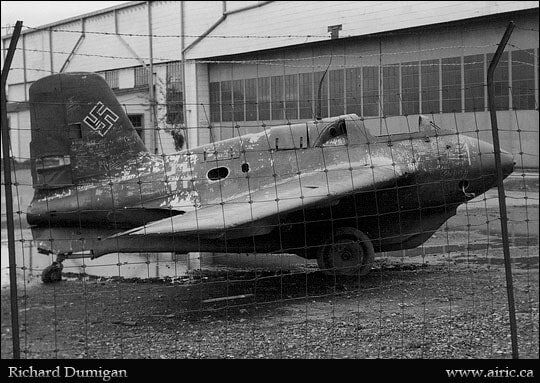 But we do know that NASM’s Me 262 was captured at Lechfeld/Bavaria in Germany, by the team of Col. Harold M. Watson. It was then, with other aircraft, taken to Cherbourg in France, and brought to the US aboard HMS “Reaper”. After arriving in Newark, New Jersey, it was flown to Freeman Field, Indiana, with a stop in Pittsburgh. It was assigned the FE [for Foreign Equipment] number 111. At some point its standard nose was swapped for a reconnaissance nose from another Me 262, this one FE- 4012. FE-4012 was sent to the Hughes Aircraft Company, while FE-111 was sent to Park Ridge, Illinois, for storage. In 1950, it was sent from there to the Silver Hill Facility, Maryland, where restoration began in 1978. According to these documented moves, I don’t see a chance that the Museum’s Me 262 could ever have been in Canada. 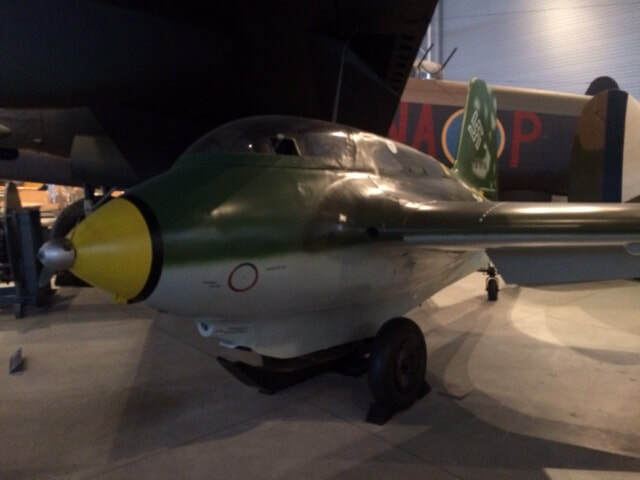 More details on FE-111 and the other Me 262 captured in Germany you can find among others in Wolfgang W.E. Samuel’s book “Watson’s Whizzers. Operation Lusty and the Race for Nazi Aviation Technology”, published in 2010. From all the documented sources I am not aware of any Canadian participation in Operation Lusty (the capture of German aircraft) or Project Overcast (the capture of German aviation scientists and research personnel). But I do agree with you that this would be an interesting piece of history that’s still missing. 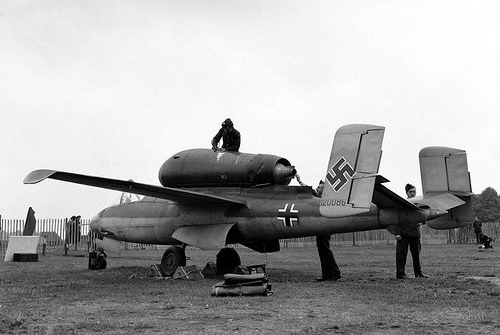 Equally interesting would be the fate of the second Me 262 which you mentioned in your email. I wish you good luck with finding answers to its fate. I will also keep your email with the records for the Museum’s Me 262, and will keep you posted should I come across any new information. Thank you for your e-mail of 17 January in which you inquire about Messerschmitt ME-262 aircraft brought to Canada circa 1945. I regret to inform you that a search of our online databases and manual finding aid failed to yield any references to ME-262s. I draw your attention to the fact that a comprehensive search of our holdings lies beyond the scope of the research assistance provided by Reference Services. Further detailed research within the holdings of the Department of National Defense fonds (RG24/R112) and the Crown Assets Disposal Corporation fonds (RG101) will likely be required. ​Lee Walsh writes: Sorry for the delay in getting back you all about this search for Farley's V2. While doing some follow up research conducted by the late Ken Molson of NAM/Rockcliffe on German captured aircraft and rockets back in the 1980s we found some interesting papers hiding in Ottawa. Ken was the curator of NAM along with Bob Bradford and they had both done some writings and research on the German a/c in the NAM's collection. Ken also had some knowledge of other captured WWI aircraft that were exported back to Canada after the War for testing. When I met up with Vince, Paul Cabot, Terry Ward, and Erl Cromie at the Toronto Aersopace Museum in 2001-2 I offered to help them with the Me262 project after a story was run in the CAHS Journal and the Toronto Star. Norm Malayney and Bill Wheeler of CAHS had published material on this aircraft but nobody seemed to know what became of Me262 AM52 in the early 1950s. I had spoken to many ex-VC920/RCN guys that were based at Downsview and they told me all kinds of retired engines and other bits simply got scrapped or sold off for beer money. We know from the incredible work that Vince, Terry, Erl what the Me262 was simply a display aircraft and that it was possibly dumped in a hole and buried as it was an easy whey to dispose of it. It makes sense as I found the RCN station at HMCS York were facing a similar problem. They had a Seafire & Swordfish to dispose of and were told by RCNHQ to get rid of them. What better way than to bury them at sea and somewhere off Gibraltar's Point are the remains of these two aircraft. I told the guys at TAM that I was going to be on a research trip in to the LAC in Ottawa and would take a look at some interesting files pertaining to captured German equipment. I found a series of RCAF/HQ papers concerning the delivery of the Me262s, Komets and other aircraft that were at RAE at Farnborough after the War and the NRC/DND had negotiated a deal to have them exported to Canada for testing. The NRC research team had requested much more equipment but only got 6 aircraft and some other bits and pieces. 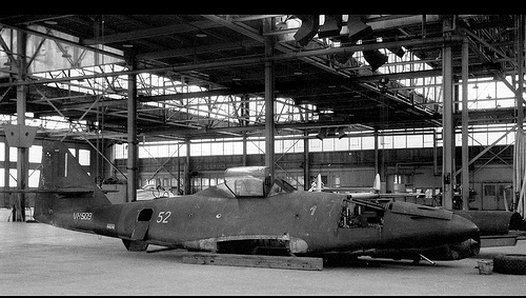 They were assembled at Rockcliffe and the Me262s Jumos were used for icing tests at the NRC Montreal Road test labs. The engines were totally destroyed and were later donated to the NAM in the 1970s. These engines most likely camoe of AM80 as I believe AM52 had her engines but unclear of the state. Witnesses tell me they had be tested and re-installed into the aircraft when shipped to Toronto. 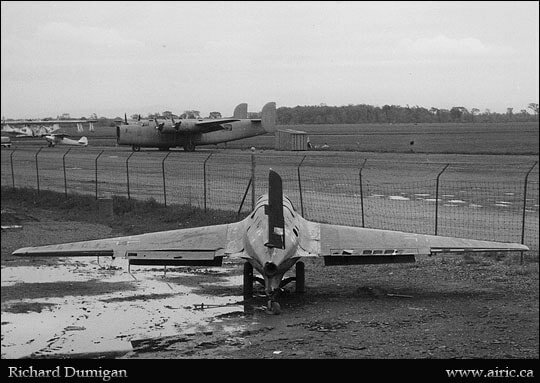 The Me262s were delivered to Toronto and Alymer around 1946-7 and it appears someone at Rockcliffe messed up with the delivery as AM80 went to Alymer instead of Winnipeg where it would have survived like the rest of the captured aircraft. Instead the base commander disposed to the wreck to Crown Assets and that is when Cameron Logan got her. In my travels in Ottawa I had came across a file on an Me109 (Wrk 1109?) that was shot down in August 1940 with Horst Perez at the controls. Lord Beaverbrook had the aircraft sent to Canada and under the ownership of the IODE it toured Canada and the US. Funny enough I tracked Horst Perez being sent to a German POW camp in Ontario and Alberta during the War and while his aircraft was touring Canada! It ended up at Arnprior like some of the other German Komets and was nearly scrapped. No testing was ever done at Arnprior but in my notes somewhere I have a reason why these aircraft ended up there. This Me109 was rescued by some fellow CAHS members and restored and currently is back in the UK at the IWM at Duxford. Historical CWM files show that the museum was not interested in acquiring this aircraft due to the condition it was in and passed on the deal in the late 1940/50s. It ended up at Arnprior and well the rest is history. While hunting for other material on these German aircraft in Canada I found a series of files that might hold some clues on the V2 rocket that Farley captured and shipped back to Canada. I was able to track the movements of it and Valcartier was mentioned in my notes somewhere and not sure why. I am attaching a list of files that I still have to go and look through and sadly the Harper Govt has killed the LAC staffing level that has resulted in the cancellation of the inter-library loan problem. So you'll have to hop in the car and head up to Ottawa to view these files and microfilm. Doug if you are looking for information on material held in your collection I would start chasing down files in the LAC on the CWM. Very interesting stuff in there and you never know what your going to find. In the meantime here is my list of files worth going after and if you need any help drop me a line. Love to know when you guys go digging! Busy helping a team in Muskoka with the recovery of a lost RCAF Nomad from No. 1 SFTS and we are hoping to get it out of the lake this summer and off to Trenton for display. As well I have another article going out on the find of RCAF Spitfire X4555 that was found on McNabs Island in the 1980s. It is a former BoB veteran aircraft and currently trying to find the family of F/O Saunders who flew her with No. 92 Sqd. 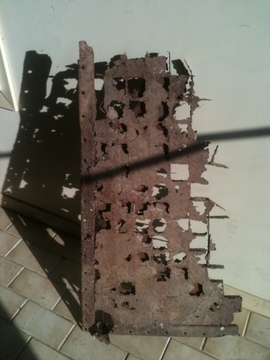 Someone snatched the remains of the aircraft and they might be back in the UK. Sadly I don’t think they know what they have in there collection! Keep you posted. Sorry for any typos as this new MS OUTLOOK is killing by workstation with JAVA errors. Sorry for the delay in getting back you all about this search for Farley's V2. While doing some follow up research conducted by the late Ken Molson of NAM/Rockcliffe on German captured aircraft and rockets back in the 1980s we found some interesting papers hiding in Ottawa. Ken was the curator of NAM along with Bob Bradford and they had both done some writings and research on the German a/c in the NAM's collection. Ken also had some knowledge of other captured WWI aircraft that were exported back to Canada after the War for testing. When I met up with Vince, Paul Cabot, Terry Ward, and Erl Cromie at the Toronto Aersopace Museum in 2001-2 I offered to help them with the Me262 project after a story was run in the CAHS Journal and the Toronto Star. "I now live in Calgary, Alberta but back in 1999 I was a volunteer at the then Toronto Aerospace Museum (now Canada Air and Space Museum) at Downsview Park working on removing Lancaster FM104 from it's pillar on the Lakeshore. 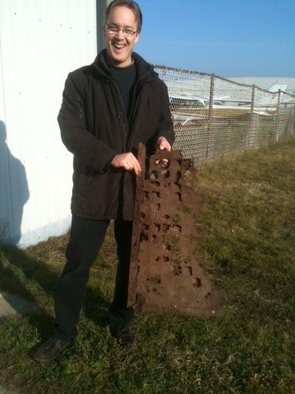 A few of the museum members were also looking for the remains of the ME262. I was not directly involved but would hear about the progress. After doing some research and discussions with several old and ex Dehavilland employees who worked there at the time they believed that they had discovered the location of the aircraft which was currently under a paved parking lot at Downsview. Ground penetrating radar was not affordable for the museum at the time and the management at Downsview would not grant permission for them to dig a hole. They has also been told that the engines had been removed and that the aircraft was quite literally run over with a bulldozer to flatten it so that it would be easier to break up and bury. Considering that probably what was left would be an unrecognizable, flattened wreck, the project was dropped." photograph courtesy of Stephen Fochuk. The sorry 191452 Komet in 1957 at left. Wings of an ME-109 that was later restored in front of it. Me 163 B-1a, Wk ''191095'' is held at the USAFM and was gifted from the National Aviation Museum, Ottawa in 1999. It was placed on display at the National Museum of the United States Air Force near Dayton, Ohio on 10 December 1999. The aircraft had been owned and restored by the Canadian National Aviation Museum. Komet test pilot Rudolf "Rudi" Opitz was on hand for the dedication of the aircraft and discussed his experiences of flying the rocket-propelled fighter to a standing room only crowd. During the aircraft's restoration in Canada it was discovered that the aircraft had been assembled by French "forced labourers" who had deliberately sabotaged it by placing sharp objects between the rocket's fuel tanks and its supporting straps. There are also indications that the wing was improperly assembled. Inside the fuselage was found patriotic French writing. The aircraft is displayed without any unit identification or Werk Nummer. So that makes at least three Komets that existed in Canada after the war. Komet, Serial 191095, Derelict St Jean, Quebec 1950 images courtesy of Eric Dumigan, taken by Richard Dumigan. Eric Dumigan has to be one of Canada's most prolific aviation photojournalists and he follows in the footsteps of his father who snapped the Komet pics below. I suspect between the two of them , they have probably captured more Canadian aircraft registrations on film than any other photographer. My own plane I keep squirreled away in a cosy hangar in Stratford, where it sits like the proverbial Spruce Goose, rarely seen by the public eye, yet when I once mentioned to Eric that I had an RV-4, he was able to produce pics he had snapped of it as well. Two He 162 A-2s (Werknummer 120086 and 120076) were owned by Canada Aviation and Space Museum, 120086 is assembled, and as of January 2012 on display. Werknummer 120076 was traded to Aero Vintage in the UK for a Bristol Fighter (G-AANM, D-7889) in December 2006. Investigations are currently being made into the practicality of an airworthy restoration of Werknummer 120076. Aircraft in Profile 203 reports both aircraft as having been refurbished in Canada in the 1960s. Currently Werknummer 120076 is displayed in Deutsches Technikmuseum Berlin. The Fi103 A-1 Re-IV Reichenberg was brought to Canada postwar, after being collected in Germany by the 1st Canadian Field Historical Section from the Fiesler factory in Dannenburg. The Reichenberg came to the CWM in 1964 from the Montreal Historical Museum, in exchange for a quarter scale model of HMS Namur. The original condition of this object was listed as complete, with instruments and a spare windshield. Also in 1964, the manned V-1 was incorrectly restored at RCAF Trenton to an unmanned version. In 1989, the Reichenberg was x-rayed at CFB Uplands to determine its true origins and in 1991, partial restoration was undertaken to put it back to its original configuration. It is believed that 175 were produced, but none were ever used in combat. This manned Reichenberg is a rare bird indeed, and at the moment sits in storage at the CWM awaiting further work. We do hold pictures of the Fi103, taken just after the war. Anyone that thinks Farley Mowat isn't one very cool Canadian should read about his involvement in snagging a V-2 rocket from the British Forces after the war even though the rockets had been banned by the Americans and British for other countries to capture (of course.....). Some of his soldiers got the British gaurds drunk that were overseeing a trainload of the rockets, and managed somehow to roll the 12 ton beast off the last railcar of a train while the distracted soldiers were led in drunken song by another Canadian soldier. They put it on a truck captured from the Germans to transport submarines, and drove back to the port where the Canadian ship awaited, unstopped by American troops when they told them it was a truck of unexploded ordinance. After disguising it by painting it blue as a submarine and adding a conning tower and propellor, they drove it right onto the ship (SS Blommersdyke) and brought it back to Canada. In all likelihood, it was the one displayed at the CNE in the photo below. 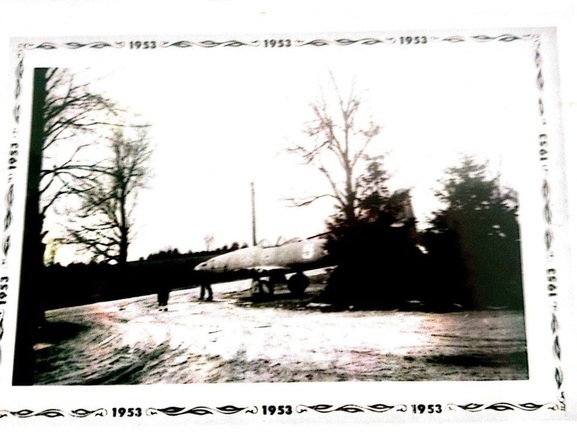 Before it's appearance at the CNE, the rocket was picked up by a Lietenant-colonel in the army and brought directly (truck trailer and all) to the Defence Research Establishment at Valcartier where it was dismantled and blueprinted before disappearing until it's CNE reappearance in 1950. Interestingly the Canadian Armament Research and Development Establishment (CARDE) as it came to be known, was best known for it's development of a sounding missile in the early 1950's. The Velvet Glove was a short-range semi-active radar homing air-to-air missile designed by CARDE (today DRDC Valcartier) and Farley told me that parts of the V-2 were used in it's development. Wally Feydenchuk provided me with this newspaper photograph of the V-2 as it appeared in Centralia. It's likely that it was still painted blue from it's trip over the pond before it was painted in this red and white scheme that is apparent on the CNE photos. The Canadian soldiers used a German mini submarine trailer to transport the rocket to the port in Holland where they were both loaded together for the trip back to Quebec-it appears to be the same military trailer. We do not seem to have information on this V-2. There are, however, a couple of paragraphs on it in a (self published?) book entitled Shelldrake: Canadian Artillery Museums and Gun Monuments, by Harold A. Skaarup. “After inspection at the Defence Research Establishment at Valcartier, the V-2 was painted black again and put on display at the Canadian National Exhibition in Toronto. It too, was later sold for scrap. Please feel free to contact me if I may be of further assistance. There is some evidence that the V-2 was given to the Americans for testing and that they actually used it up by launching it!..This dismayed the Canadians greatly, but the scuttlebutt was that the Americans felt they could get away with doing so, as we were not supposed to have it anyway. I have not come across reverse engineering records, but that is not to say that they don’t exist. Often, our best finds are from people who spirited them out of garbage cans after they were deemed surplus to requirements and pitched out. I have many favourites, as we hold some pretty significant objects relating to Canada’s aviation history, but I would list my current favourite as the Rheintochter surface to air missile: very large and very impressive. Btw, we also hold a Loon, the U.S. produced version of the V-1. editors note: Doug suggests that former members of the Canadian foreign affairs bureau are the source of the story about the rocket going to the US so the likelihood is pretty high. My sincere apologies for the delay in my response. Unfortunately, we have had a multitude of internet and computer challenges. Indeed, we are most excited by the possibilities that the V2 rocket may be buried on site. We have heard a multitude of heresay over the years; but, as with most stories we have been dubious. And, we certainly have not come across any factual proof or documentation. There are a couple of places where the rocket could potentially be buried. And, we are most willing and enthusiastic to allow the gentlemen from the War Museum to search the site with ground penetrating sonar. We have received permission from the company's directors as well. We certainly agree that this rocket is an important part of Canadian aerospace history and we would certainly appreciate the opportunity to participate in it's recovery. Please do not hesitate to contact me at 613 476-3064. The principles of aerodynamics for the shape, mass, etc. of the rocket body are similar for the Black Brant and the V-2, but that is where any similarity ends. The original design of the Black Brant was done by Bristol Aerojet in Britain to be a test-bed for a new solid rocket fuel developed by the Canadian Armaments Research and Development Establishment (CARDE). As a solid-fuel rocket, the Black Brant bears no direct relation to the liquid-fuel V-2, which internally is much more sophisticated. The Black Brant’s motor case is essentially a hollow tube with a nozzle, as compared to the V-2’s liquid fuel and oxidizer tanks, fuel pumps, and other systems required. It is possible that some elements of V-2 research were incorporated in terms of the design of the exhaust nozzle (although I cannot confirm this), but that’s about the only other point of commonality between the two rockets. I hope this helps. Thanks for your interest! 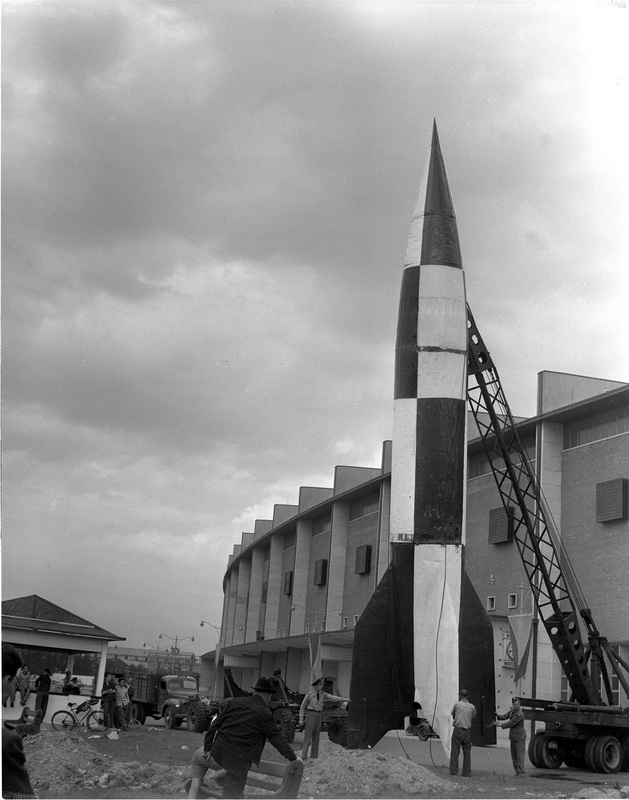 Germman V-2 rocket as it appeared at the CNE from CNE archives. Some believe the Farley Mowatt rocket was brought back to the US and eventually ended up at the Aberdeen Testing grounds. 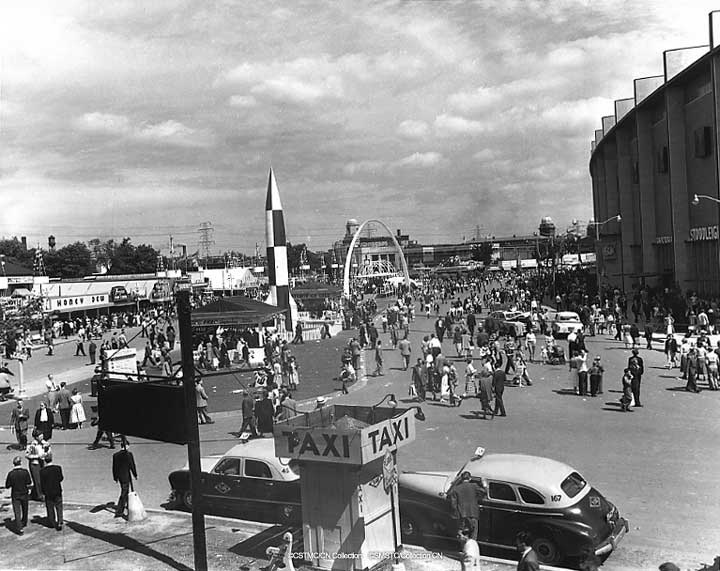 This is a photo of the rocket at Aberdeen and it seems highly unlikely that this was the same one from the 1950 CNE. This one seems to be on an original V2 bed and would have been brought back to america on it. Farley's was brought back on a different trailer and the paint scheme also does not match. It also unlikely that the paint would have deteriorated to this extent since the 1950 appearance (also a different colour). 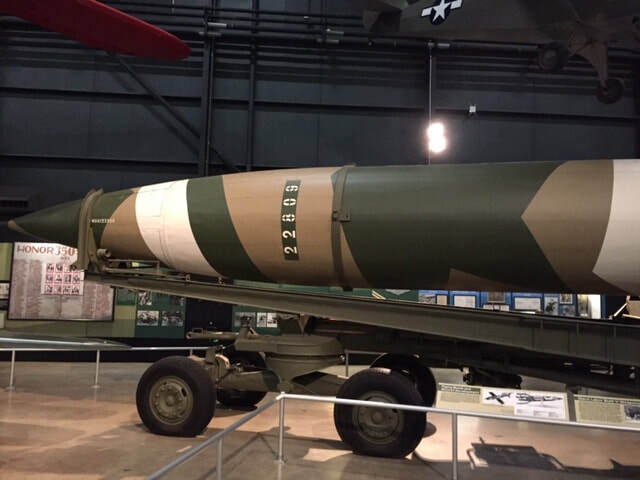 The Aberdeen rocket is now restored and in possession of the NASM in the United States. (Nordhausen-Mittelwerke)along with the parts and major components. My reasons for writing are to thank you again for your dedication to aviation history and to tell you a story about “Connections” and/or a “Six Degrees of Separation”. This is a bit like Paul Harvey and the “Rest of the Story”. It is all about “White 35” a two-seat Me 262 -B-1a/U1. In the early 1970’s my dad, who had high national security clearance, was running the Naval Air Development lab for Air Navigation. The lab was on the base property for the former Johnsville NAS (formally a Brewster Plant), Warminster , PA (NW of Philadelphia). Dad spent his whole career at the pinnacle of air navigation developments. These included developing Inertial, Doppler and ultimately GPS systems before he retired. He spent many months on board aircraft carriers, out on the White Sands Proving Grounds in New Mexico , making many trips overseas, and certainly years’ worth of days at the Pentagon in DC. Remember the Pentagon. In the same time period, I was entering my teen years, and I voraciously read about all aviation, especially about the 8th Air Force and the ETA. I even saved up to buy a first edition of Roger Freeman’s The Mighty Eighth and practically wore it out (and still have it). Whenever opportunity knocked, I did my best to keep up with the latest news through Air Classics and Air Power. I gravitated most to Air Classics and loved reading the letters written to your magazine. In fact, one day I got the nerve up to write a letter of my own. It all started during the summer when dad took me over to another local Navy Air Base for Armed Forces Day. While everyone else watched the Blue Angels’ routine, I walked to the front of the base amongst a row of one-of-a-kind warbirds. The saddest of the bunch had the canopy unlatched so I climbed in for thrill. What I found was just heart wrenching for me and so I wrote my letter to Air Classics. I hoped you could influence a change. In a nutshell, I described an airplane sitting out in elements, damaged by bird droppings, souvenir seekers and generally in a sad state of disrepair. I signed it, addressed the envelope, and placed it into a mail box. Now, Dad is Sr. and I am actually Jr. On this letter I neglected to add the Jr. to my signature and that would mean trouble for me. A couple of months later, lo and behold, my letter was published in Air Classics. In addition, you, Michael, also responded, at length, to my observations with a request that the Navy not let these historical aircraft go to waste! And, remember, this particular airplane and others were still on outdoor display on NAVY property. OOPS! A couple of days later Dad came home from a long trip down to Washington D.C. and long meetings at the Pentagon. I couldn’t wait for him to come in the door so that I could show him that I was a “published author”. Dad walked in, put down his coat, then his briefcase, and said, “Get in my car, now!” Oddly enough, Dad also had the same Air Classics issue. I should have sensed a problem but didn’t yet have a clue. We spent the next hour driving in the country while he gave me chapter and verse on what his week was like explaining that published letter to the Navy brass. You can imagine the lessons I learned on how to sign my name forever in the future. The story doesn’t end there. Someone else who read my letter was the late Steve Snyder of parafoil parachute fame. It sparked his interest as he also had great respect for this bird known as the Swalbe (Swallow). Living close by in New Jersey , Steve visited that sad sight often. By the 1980’s, Steve had become a board member of the new air museum, The Delaware Valley Historical Aircraft Association (DVHAA) located at Willow Grove JRB (Joint Reserve Base) and this particular airplane was the one that he was interested in most. We crossed paths at various air shows then at DVHAA and realized that we had a common bond of in restoring historical aircraft. He confided that he wanted to create his own flight museum, the Victory Air Museum , in Lumberton , NJ . He even wanted to offer me a job doing his fundraising. Though we never came to an agreement on the job, we still agreed that this particular airplane still held our interest the most and he was determined to find a way to get it restored. The Navy still owned this rare airplane and Steve still had close ties with the Navy. They eventually listened as Steve proposed borrowing this airplane to have a specialty company in Texas reverse engineer its components. This way, newly created versions might be manufactured and also have the original restored. An “accord” was granted and Steve was off to get his wish. Unfortunately, just as the airplane, known as “White 35”, was disassembled into pieces in Texas , Steve and his Canadair F-86 jet flipped over while landing at his home base in New Jersey . He, unfortunately, died in the crash. 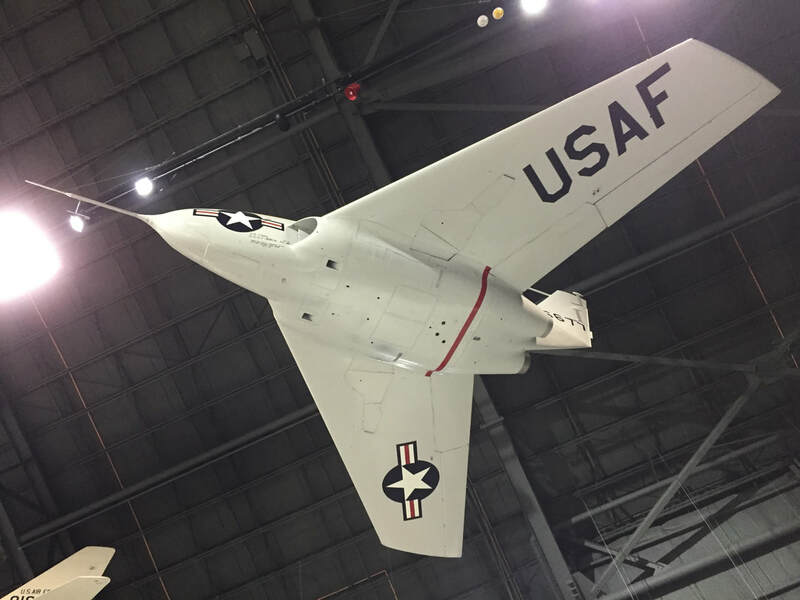 The project floundered but was eventually reorganized and turned over to a group in Washington State and, in the end, new versions of the original have been built and even flying. So, if you haven’t already caught on, this airplane was the two seat Me 262-B-1a/U1 known as “White 35” that stood out in the elements for 40 years at Willow Grove Naval Air Station in Horsham , PA.
And now I feel I am coming full circle. As a kid I sat in the cockpit of that B-1a, shocked and dismayed that such a rare bird would never fly again. Thanks to the Collings Foundation and their announcement that they have acquired their new Me 262-B-1based directly on “White 35” , I may yet have another opportunity to possibly bond again with the Me 262 Swalbe and I especially look forward to seeing it fly- someday soon! 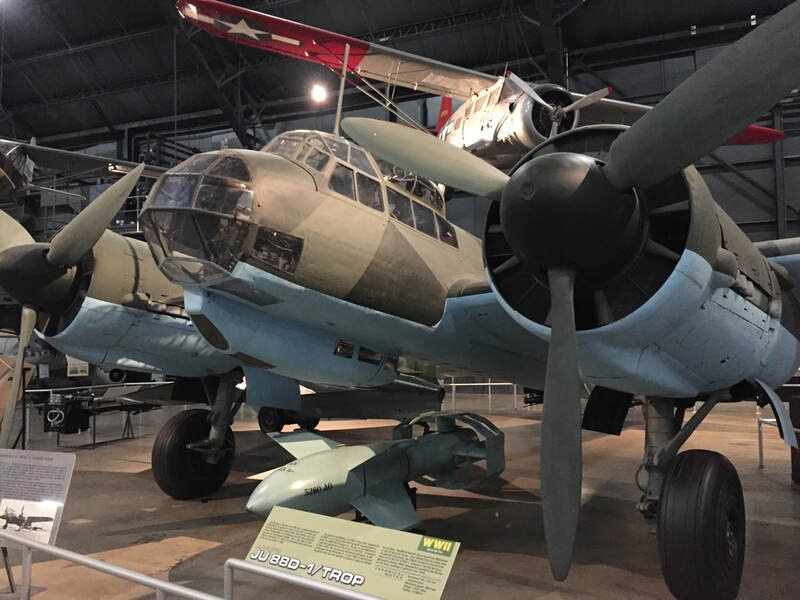 This Romanian JU-88 was known as the Baksheesh and was evaluated extensively at Wright field before being stored for years in the Arizona desert. Captured in July 1943 by a defecting Romanian pilot.